Where is my nearest bus? 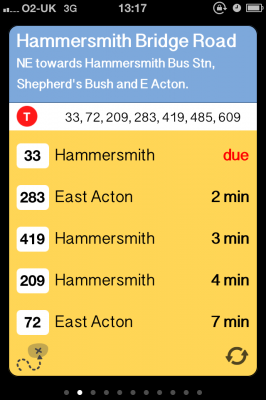 Nearest Bus uses the TfL Countdown prediction service to show you when the next bus is coming at the stops near you, so you know when to run for the stop, or when to think about catching a taxi instead. Where is the Nearest Bus? The countdown service is a "beta", so TfL may decide to remove it. They have publicly said they are working on an official API, but keep in mind this may stop working at any time. If you are not in London, or within 250m of a bus stop, it's pretty useless. If you live in the US, don't buy it. Or rather, DO buy it, but don't complain about it. Read the first one again. Any feedback is always welcome. 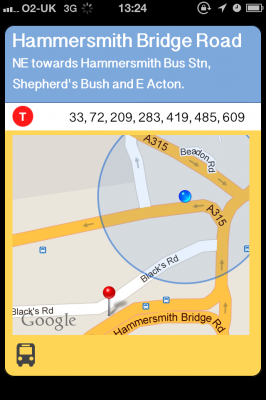 Nearest Bus is 100% iOS5 compatible, and 100% MonoTouch. I'm planning on adding a few more features, and supporting the official API when / if it comes out. Enjoy!